The sea views at Villa Anemos are mesmerising. You can sit back, relax and take in this fabulous setting from your living area, outdoor terraces, private pool and gardens - bliss! With Kalathas Beach being just a 5 minute walk away, it's a beach lovers haven too! A great choice for anyone wanting a stunning villa with the beach practically on your doorstep! Air conditioning/heating in all bedrooms and WiFi are included in this 4 bedroom house. A simply stunning sea view villa and the beach is just 5 minutes' walk away - a perfect choice for the true essence of Greece! The outside space is amazing, with the private pool surrounded by a well-tended lawn and the Aegean Sea as its backdrop. To the side of the pool is a shaded terrace with a small table, seating and brick BBQ to one side - great for an alfresco meal or snack whilst watching the sun set. There is also a raised terrace off the open plan living area that has dining table and chairs - the perfect spot to experience the wonderful views. Access to Villa Anemos is via a remote controlled gate and a fairly steep driveway where you can park your hire car. The entrance door is at the front of the house and leads straight into the first floor. The contemporary open plan living area is bright and airy. There is a flat screen TV and corner sofa that faces out towards the dining area and sea beyond . The kitchen/dining area that has all mod-cons to cater for your villa holiday. With floor to ceiling patio doors, leading out to the raised terrace, there's lots of natural light and amazing sea views. On the first floor there is a spacious double bedroom and 2 single bedrooms, sharing a separate shower room. On the ground floor/pool level, there is a compact twin bedroom that is accessible via exterior steps only. There is 1 single bed and 1 cabin bed and also has an en suite shower room - an ideal space for teenagers. This villa is registered and licenced by EOT Greek licensing association. This number is: 1042K123K2962601. Villa Anemos is a beach lovers' paradise! With the sea at the foot of your garden and Kalathas Beach and a taverna just a 5 minute walk from the villa, what more could you want? 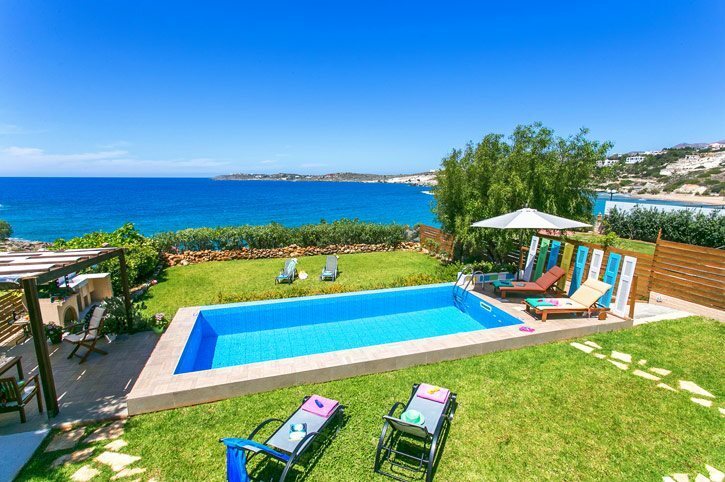 Located on the Akrotiri Peninsular, close to the historical town of Chania, this beautiful house is an ideal choice if you are wanting a mixture of the relaxation of a beach holiday and where you can experience some Cretan culture just a short drive way - perfect! The area of Kounoupidiana is 10 minutes' drive from Villa Anemos. Here you will find 3 large supermarkets as well as bakeries, grocers, banks and pharmacies. A little further afield is the indoor market in Chania, which is an Aladdin's cave for those who like to try local cheeses and olives. The market on Saturday, also in Chania, is the place to head to for the freshest local fruit and vegetables. Villa Anemos is located on the Akrotiri Road not too far from the airport. Here you will find one of the most popular beaches just a 5 minute walk away and a great taverna which is open from mid-morning until late in the evening. There is a wider choice of places to eat and drink along the - waterfront - at Chania Harbour. Amongst the quirky maze of streets within Chania Old Town is an eclectic mix of shops which will fascinate with traditional crafts such as the Cretan boot maker and boutiques. The sandy beach of Kalathas is just a short walk from Villa Anemos and has a variety of watersports, sunbeds, umbrellas and a taverna which serves local dishes. The beaches in the area of Akrotiri are arguably a largely undiscovered jewel and tend to be smaller, tucked away off the tourist track but well worth a visit. A mini golf course is a 5 minute drive away, whilst closer to Chania you will find Golden Fun Park with play activities and 10 pin bowling. The waterpark of Limnoupolis is great for all the family to enjoy and is only a short drive away. Mega Go Karting is on the outskirts of Chania and open 11 hours a day with a children's playground too! There are 2 monasteries situated on the Akrotiri and are well known for the wine they produce and the fabulous caves close to the monasteries with stalactites and stalagmites. The town of Chania is about 20 minutes' drive away and should not to be missed. The buildings in the narrow streets are breath-taking, these are where Venetian and Turkish architectural features can still be seen. Why not head down to the quieter side of the harbour and visit the Naval Museum where a Minoan boat has been reconstructed? You could take a stroll along the harbour front and maybe jump on a boat for a trip around the local coastline. The main 18-hole golf course is located just outside the resort of Hersonissos on the eastern side of the island. Take a look here at the Crete villas that are currently on sale. Villa Anemos is not available to book for season as it is sold out. Take a look here at the Crete villas that are currently on sale. This very popular sport can be found on the beach in Almyrida as well as some beaches west of Chania in and around the resort of Platanias. Boards of varying sizes with sails to suit varying weather conditions can be hired. Lifejackets are also provided. There are two Ten Pin Bowling alleys in the Chania area for days when all the family want to escape the sun baked beaches. There are several go kart tracks suitable for children in the resorts of Chania and Rethymnon. They are smaller tracks and smaller karts geared especially for budding Formula 1 drivers! This great water park is set in a fabulous countryside setting away from the busy resorts of Chania. It’s 8 kilometres from the town of Chania and has a variety of rides from Kamikazi to the Lazy River. 100% recommended, Quite possibly the best place I have ever rented, perfect setting, well equiped, and very well maintained. The owner is rightly proud of her Villa. Villa Anemos was fabulous. The views were great and the sunsets were spectacular. We couldn't have been any closer to the sea! The villa is equipped with everything you may need and is decorated to a very high standard. There is so much space both inside and outside. The location is peaceful and perfect for getting away from the hustle and bustle of everyday life. Our Rep Sally was great and provided us with valuable information to enhance our stay. Sally was professional and friendly and it was a joy to meet her when she paid us a courtesy visit. We also had the pleasure of meeting the owner - Stella who took the time to ask us if anything was alright. Stella should be very proud of her villa, its wonderful. The villa is so close to Kalathas beach and we often strolled down to the swim or eat at the restaurant, which provides excellent food. We loved our holiday and highly recommend staying in this villa. Customer Suggestion: Keep up the good work!